The transmission of data over the new generation of digital radio communications is proving increasingly popular with the emergency services, government, security, transport, construction, exploration, utilities and military sectors. However, RoIP/IP over Radio systems are frequently deployed in extremely challenging conditions such as natural disasters, storms, blackouts, difficult terrains (mountains, tall buildings) etc. Therefore, it is imperative that such systems are thoroughly tested prior to live deployment to ensure they will work effectively in potentially “life or death” situations. Until recently, finding realistic ways to introduce adverse radio conditions in the test situation, from prototyping to the pre-deployment testing of the equipment, has had its limitations. Typically, radio reflections and interference were created in a laboratory using radio reflectors and radio sources. However, the difficulty in setting the reflector and sources to exactly the same position every time, in order to achieve particular adverse values, made it very challenging to recreate the same networked radio environment consistently. In contrast, iTrinegy’s INE Enterprise network emulator uses wired connectors to enable the RoIP testing of devices by emulating the behaviour of radio networks. Conditions such as data loss and interference can easily be altered by simply changing the required setting via the GUI and different test scenarios saved for subsequent re-use. The conditions within a saved test scenario can also be made to change dynamically over time, adding to the realism of the test. As a result, INE Enterprise offers a level of accuracy, control and consistency that other methods cannot achieve. Example - A Radio Thunderstorm on Demand! If you know that the electrical conditions in a thunder storm are likely to adversely affect the Radio over IP communication devices being used out in the field – how do you test that? Do you sit with multiple devices in a field waiting for a thunder storm? No. 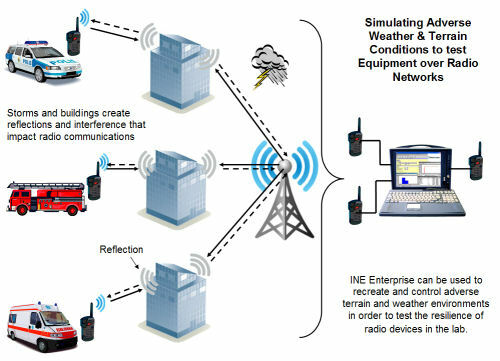 By using INE Enterprise you can create a virtual thunderstorm on an emulated radio net. So there is no need to wait for a thunderstorm to happen to test that condition – you can call the thunderstorm to order and furthermore can repeat the same conditions over and over again. In addition to the ability to set up consistent and controllable RoIP test conditions, INE Enterprise also reduces the need to conduct real field trials until much later to the product development lifecycle which substantially cuts costs.